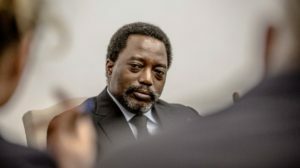 Democratic Republic of Congo’s (DRC) president Joseph Kabila will not contest upcoming elections, the information minister Lambert Mende said. According to Mende, Kabila intends to respect the constitution of the country and to hand over power after the December 2018 elections. He said the president will, in July this year, announce his preferred successor for the elections. Kabila, 46, has been in power since 2001, at the helm of a regime widely criticized for corruption, repression and incompetence. He was elected president in his own right in 2006, and re-elected to a second term in 2011. His constitutional term in office expired in December 2016 but he stayed on, under laws enabling him to remain in office until his successor is elected. The authorities late last year postponed the election until December 23, 2018, citing what they said were logistical problems in preparing for the vote. Head of the electoral commission, Corneille Nangaa said a total of 46,021,454 voters had been registered, 12% more than expected. Scores of people have been killed in the past year in protests, organized by the Catholic Church, against Kabila’s refusal to step down in December 2016, and delays in calling new elections. Some opponents suspect Kabila of seeking a referendum to change Congo’s constitution to enable him to run for more than two terms. Posted by Geraldine Boechat on February 6, 2018. Filed under News. You can follow any responses to this entry through the RSS 2.0. You can skip to the end and leave a response. Pinging is currently not allowed.